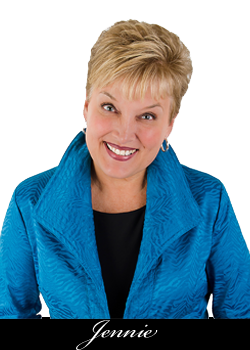 "Jennie Dimkoff is a brilliant, energized speaker. One minute you will be in side-splitting laughter, and moments later you will be wiping tears from your eyes. Her giftedness as a speaker is instantly obvious, and her sensitivity to God's Spirit touches hearts and motivates audiences to make life-changing decisions." -Carol Kent, Founder and Director of "Speak Up With Confidence" Seminars, International speaker, and author of When I Lay my Isaac Down, A New Kind of Normal, Unquenchable, and others. "Jennie's gift of storytelling touches something deep inside of me. Lean in and hear night whispers of love that will turn into day shouts of praise." -Patsy Clairmont, Women of Faith speaker, author of "Mending Your Heart in a Broken World"
"Jennie keeps her audience spellbound, listening intently to every word. An extraordinarily gifted storyteller, Jennie will always be welcome at Women Alive conferences in Canada. Her ministry among us has made marked changes in the lives of women who identified, understood, and were challenged to grow in God." "I have recommended Jennie Dimkoff frequently as a speaker, and retreat coordinators come back and thank me profusely. They love Jennie's warmth and spark, but more than that, they say that women's lives were changed because Jennie brings the Scriptures to life. Jennie addresses issues women are hungry to hear about with depth, understanding, and vitality." "We had the privilege of having Jennie Dimkoff as our Women's Ministries guest speaker. A fabulous communicator and storyteller, Jennie effectively wove together Scripture, biblical principles, humorous life experiences, and personal anecdotes! Our women loved her." "How many times can you reflect on a message heard years ago and still remember the vivid imagery of the story and the accompanying challenge from Scripture? I love how Jennie Dimkoff can paint me into the picture of her stories and give me simply stated but profound truths to take home and apply to my life." -Lael Arrington, author of Worldproofing Your Kids, Faith and Culture: The Guide to a Culture Shaped by Faith, and others.